After growing up flippin’ rocks and chasing snakes throughout Kansas and Missouri, Joey attended the University of Kansas (KU) as an undergraduate student, and transformed his childhood fascination into a passionate pursuit for a career in the fields of herpetology, ecology, and conservation biology. After receiving an undergraduate research award his sophomore year, Joey had the privilege of working with the legendary herpetologist Dr. Henry S. Fitch—often referred to as the “Father of Snake Ecology.” Dr. Fitch’s quest to understand nature was inspiring and gave Joey his first introduction to field-based ecological research. Working closely with Dr. Fitch and his colleague George Pisani, Joey assisted in several snake ecology projects. One of his favorite projects still today involved the use of radio telemetry to study den dispersal and population ecology in Timber Rattlesnakes (Crotalus horridus). This study was the first to inspire his early interests on the conservation side of data collection and analysis. In addition to spending his summer’s in the field with Dr. Fitch surveying snake transects, Joey was also fortunate enough to spend most of his undergraduate career working as a research assistant in Dr. Rafe Brown’s Lab in KU’s Herpetology Division at the Biodiversity Institute. Working in one of the world’s most significant amphibian and reptile natural history collections, Joey’s research interests expanded quickly to include the fields of systematics, phylogenetics, and biogeography. These laboratory-based experiences under Dr. Brown perfectly complimented the field-based research experiences he gained during his work with Dr. Fitch. Shortly after graduating from KU, Dr. Brown provided Joey with an incredible opportunity to join him as a research assistant on a three-month biodiversity survey throughout the Philippine islands. Home to so many distinct ecosystems, the Philippine island archipelago in Southeast Asia is recognized as a global hotspot for biodiversity. During this field expedition, Joey had the pleasure of working with a large team of herpetologists (including Cameron Siler! ), mammalogists, ornithologists, and parasitologists. This life changing trip was topped off by the discovery and description of the world’s fourth fruit-eating monitor lizard, Varanus bitatawa. In addition, this three-month expedition quickly turned into five months, as Joey remained in the Philippines with Cameron to assist him in research during his Fulbright-Hayes Fellowship. Dr. Siler’s extensive experience in the country allowed for Joey to further develop his skill sets in field-based research, and resulted in a wonderful, long-term collaboration. Following this research expedition, Joey continued his journey through Southeast Asia and spent the next year traveling abroad. From island hopping in Thailand, boating down the Mekong River in Laos, exploring the temples of Angkor Wat, or getting lost on the streets of Ho Chi Minh City, Joey immersed himself in the culture of this beautiful region and fell in love with everything it had to offer. Soon after returning home from his travels, Joey was thrilled to be selected as the successful job candidate for a Reptile Keeper position in the Herpetology Department at the San Diego Zoo, an institution recognized globally for its numerous on-site ex situ conservation efforts, as well as a multitude of in situ research programs focused on wildlife conservation around the world. While working with a collection of more than 1,400 live reptiles and amphibians, Joey had the privilege of being mentored by his supervisors Kim Lovich and Brett Baldwin, as well as many of his colleagues who have all been in the professional field for more than 20 years. This provided Joey with vast training and experience in animal biology, behavior, natural history, and husbandry, along with techniques for capture and restraint of exotic venomous snakes, large pythons, crocodilians, and large varanids—including his favorite Komodo dragon, Sunny (see picture). In addition to working with the cold-blooded collection at the zoo, Joey would routinely speak with K-12 school classes and participate in live television interviews about reptile conservation. Through these experiences he came to realize the importance of public speaking for education outreach and awareness. This connection with the public, especially children, further sparked his passion for conservation. 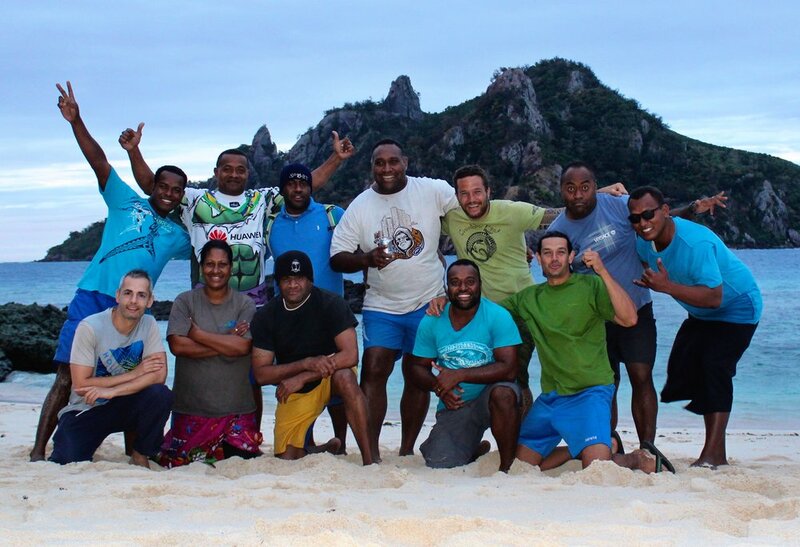 In 2014, Joey once again joined Cameron on a four-week biodiversity study on Samar Island in the Philippines. Working alongside Dr. Siler and his colleagues in the field, and collaborating on writing several scientific publications, helped to define his career aspirations and make the decision to pursue a career in academia. As a graduate student now at the University of Oklahoma, Joey is super excited as he focuses his studies on the ecology and conservation of crocodilians and squamates (lizards and snakes) around South East Asia and the South Pacific. After completing just his first semester at OU, Joey was offered a wonderful internship to join the United States Geological Survey (USGS) San Diego Zoo and depart on a six-month research expedition in Fiji that focused on the ecology and conservation of the critically endangered Fijian crested iguana (Brachylophus vitiensis). Working on a large collaborative project supported by San Diego Zoo Global, USGS, International Iguana Foundation, and the National Trust of Fiji, this study used radio telemetry (via tiny VHF transmitters attached to the body) for an in-depth study of iguana behavior and spatial ecology. Additionally, the team released a large group of head-started (captive-bred) iguanas onto the island to boost the wild population. Joey then had a busy year of field work tracking the movements and interactions between captive-bred and wild iguanas to figure out the iguana’s dispersal patterns, preferred habitats, and survivorship of the head-started iguanas. 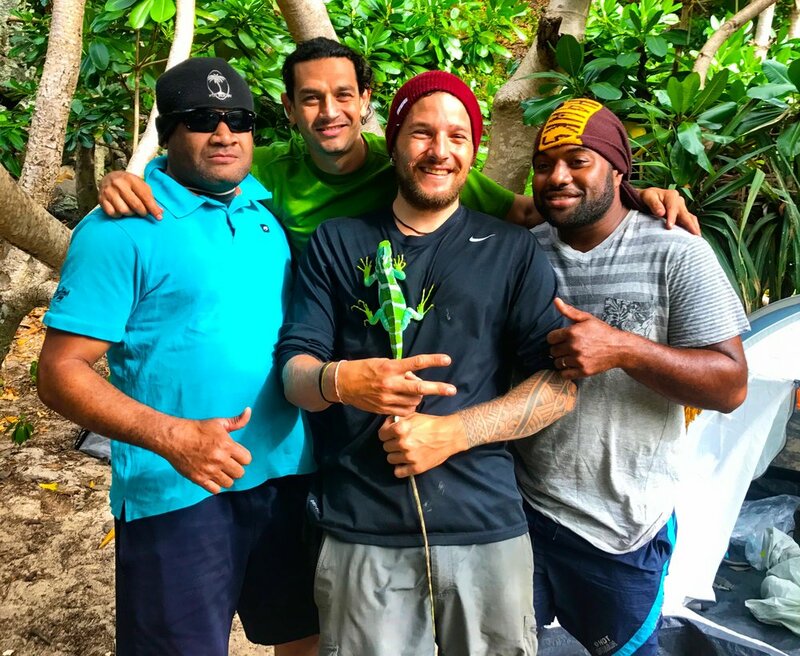 Focusing on community-based conservation efforts, Joey and the team built strong in-country relationships working with local Fijians in every aspect of this project as they try to save this imperilled iguana species on the brink of extinction. Climbing trees and catching iguanas on a routine night survey to assess the wild population on Monuriki Island. Joey and Jhaba, his field partner and Iguana Ranger for Monuriki Island. Apologies, this page is still under construction. Please stay tuned for more as Joey will be in the Philippines for 2018 researching as a Fulbright Fellow and National Geographic Explorer studying the Critically Endangered Philippine crocodile.